but we sure like the way it feels. THIS MEMBERSHIP IS FREE TO FOR YOU TO ENJOY. SO, PLEASE JOIN US & ENJOY! Through our Happenings Membership we offer events and programming that build community, make people happy, drive success, and help make the world a better place. This includes classes, workshops, and casual talks — all handled by experts in their respective fields. We're not gonna lie, our gatherings are not all about do-gooding. Sometimes we just hang out and play chess, or drink beer, or read, or simply enjoy the mindless superficiality of Instagram. Check our calendar for the latest Constellations events, and be sure to drop by to say hello. LOOKING FOR AN EXAMPLE OF THE FUN WE HAVE? HERE YOU GO...PLEASE ENJOY! Are you hosting an event our members should know about? Have an idea for an event at Constellations? Contact Us, or email our Director of Events, Brooke Rasheed, brooke@constellations.community. Constellations will be taking up residency in Co.Lab - the espresso café gallery - at the Museum of Design Atlanta (MODA). Come visit us every Thursday from 11am - 2pm for the duration of the exhibit Passione Italiano: The Art of Espresso — on display until June 9th, 2019. All are welcome! Periodically it’s nice to read an article. We do that, then talk about it over coffee. Like a book club with less commitment. For the “Art of Espresso” exhibit at MODA, Periodical delves into design, romance, technology, and caffeinated derivatives. 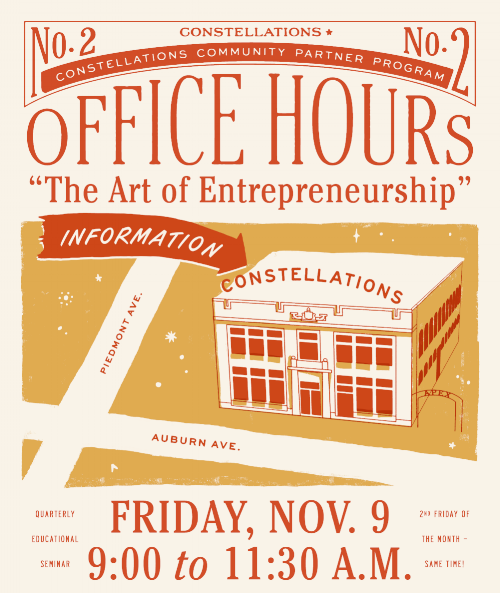 OFFICE HOURS - "THE ART OF ENTREPRENEURSHIP"
Join us November 9th for "Office Hours", a quarterly series bringing business insights to the cultural community. This month, "The Art of Entrepreneurship", features open-door Q&A with some of the stellar minds and entrepreneurs from within our galaxy. Plus, FREE COFFEE by Condesa Coffee and BREAKFAST by Happy Camper. FRIDAY NOVEMBER 9TH FROM 9:30AM - 11:00AM. AT CONSTELLATIONS. SCAD FASH Museum of Fashion + Film is honored to feature the designs of the legendary fashion futurist Pierre Cardin in “Pierre Cardin: Pursuit of the Future,” a major retrospective exhibition. It's amazing. NOW ON VIEW - SEPT. 30, 2018 See the exhibit. Join us for an unforgettable night of scholarship, history, and memory as award-winning author Gary M. Pomerantz discusses his definitive saga of white and black Atlanta in the heart of Sweet Auburn. Author talk followed by interview with the AJC’s Bill Rankin. FREE AND OPEN TO THE PUBLIC, please Click Here to RSVP and secure your spot! OUR GRAND OPENING IS JUNE 1ST. 10:00AM - 12:00PM AT 135 AUBURN AVENUE. Celebrate the holiday in one of our country's most historic churches. SUNDAY DEC. 24TH • CHRISTMAS EVE • 10:00 AM at Ebenezer Baptist Church. Full of heart-melting numbers like “God Bless the Child,” “Strange Fruit,” and “What a Little Moonlight Can Do,” Billie shares with us her loves and losses in this award-winning musical fresh from its recent Broadway and London revivals. JANUARY 11TH - FEBRUARY 4TH at Theatrical Outfit. This 5K will have a vibe like no race ever run. The party starts at 8am. Drummers will keep the beat as your feet hit the street. MONDAY JANUARY 15TH - AT 8:00AM at Piedmont Park. You are cordially invited to come commune and celebrate the launch of our website on MONDAY AUGUST 21ST FROM 7:00 - 9:00 at Victory in Inman Park. Community Partner, The Auburn Avenue Research Library, in collaboration with Gene Kansas Commercial Real Estate & Constellations, hosts an international collaboration of arts and culture aptly entitled "Voices of The World". This exhibition by internationally renowned street artist Gonzalo Borondo is FREE AND OPEN TO THE PUBLIC.